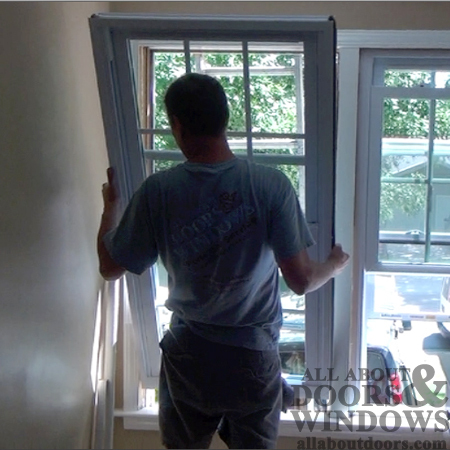 This article specifically details the process for replacing double-hung sash windows, however, the process for removing single-hung windows is very similar. We carry Andersen Silverline replacement windows as used in the following guide. 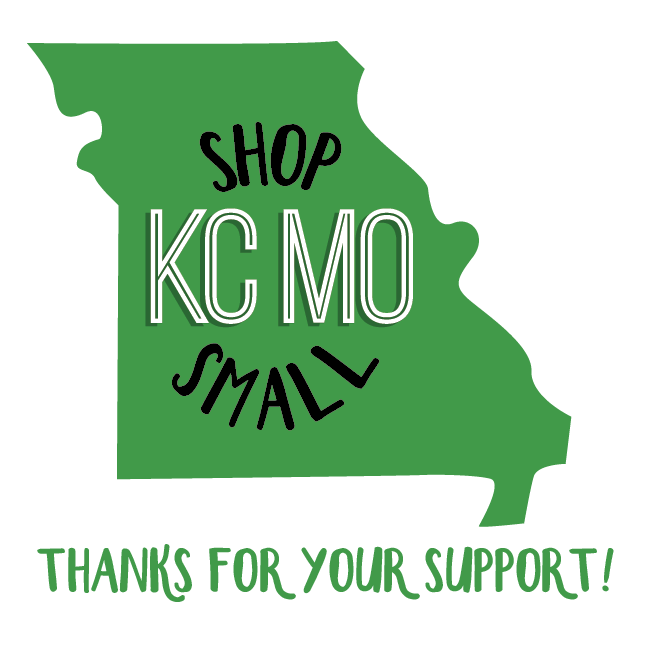 Orders are made via phone at All About Doors & Windows, call and ask for Randy. Read through entire article before attempting. Make sure you have someone to help you. Exercise extreme caution while on ladder; if you don't feel comfortable, ask for help. 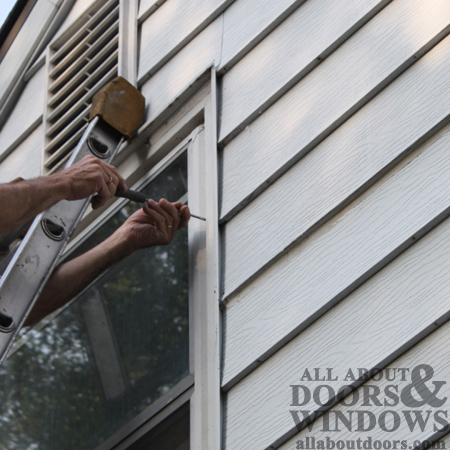 Run razor blade along the outside edge of the storm window to break the paint seal. Use a screwdriver to remove all the screws from the storm window--you may have to scrape paint off the screws first. 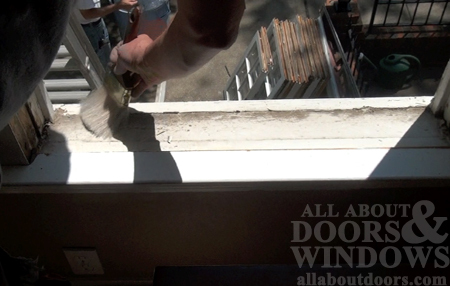 Lift storm window out of the building--if you're on an upper story, hand the window down to a partner below. 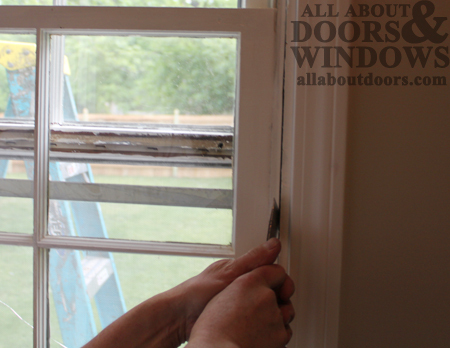 From the inside of the window, use the razor blade to break the paint seal between the window frame and top and side stops. 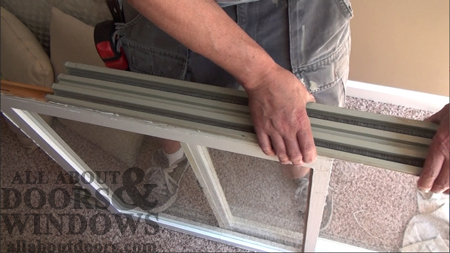 These are the flat, thin strips of trim that line the inside edge of the window. 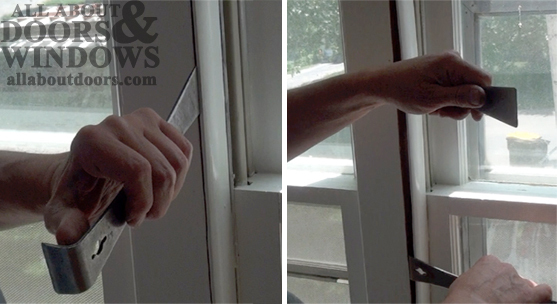 Use two flat pry bars to get in-between the stops and the window frame. 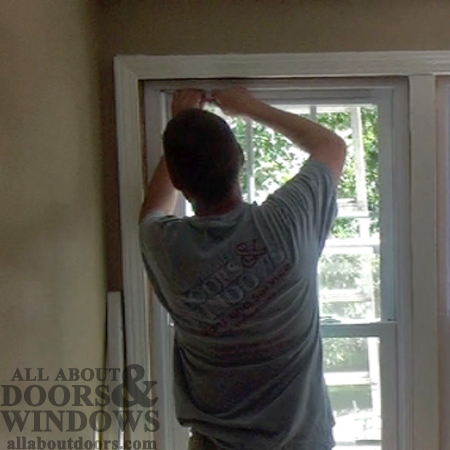 Carefully work your way down the length of the window to loosen the stops. the stops are nailed in and should easily pry off, but work carefully and slowly to prevent breaking the stops. You will need to reuse them after you install the new window. The side stops come off first, then the top the top. Remove any nails that remain in the window frame. Once you've removed both side stops and the top stop, you should be able to see the head parting stop, which separates the two sashes and keeps them from rubbing against each other. Pry off the head parting stop the same way you did the other stops. You do not need to worry about saving the parting stop, though; you won't need to reuse it. Now, you should be able to see the jamb liners. 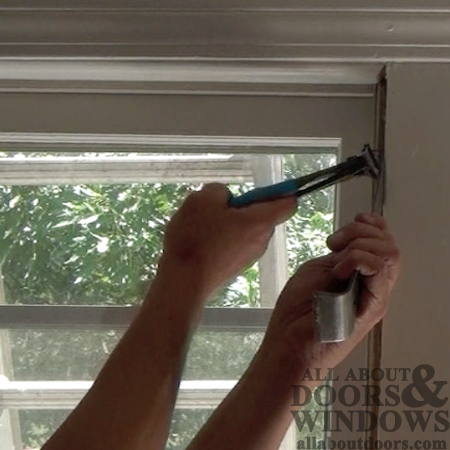 The jamb liners run up and down the sides of the window frame. These aren't nailed or screwed in but held in place by the sashes. 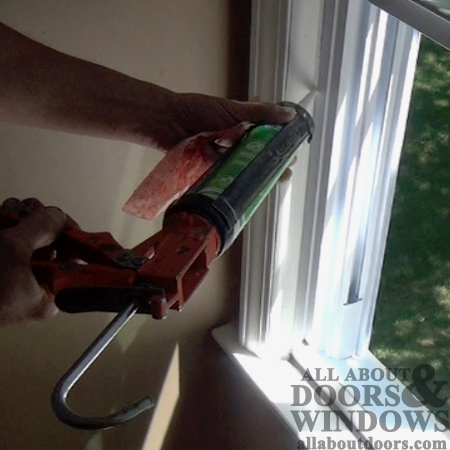 You should be able to easily stick a pry bar in-between the liners and the window frame. 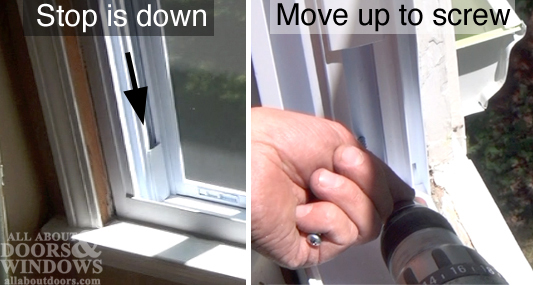 Loosen the liner--you should be able to move the pry bar in-between the liner and frame clear up and down the length of the window. Raise the inside sash a little bit and lower the sash a little bit as well, so there is vertical space between both sashes and the window frame. Grip the sashes and carefully pull them in through the frame. The jamb liner will be dislodged as well. Set the sashes down. The liners house the window balances and are attached to the sashes via large springs. Carefully slide the sashes off the liners. Watch out for the springs which could fly off. While your window frame is empty, use a brush to clean all the dirt and grime out of it before beginning installation of the new window. *Note: The raw window frame that you have at this point should be the dimensions of your window--the size you ordered. To install the new window, carefuly lift it up and into the frame. 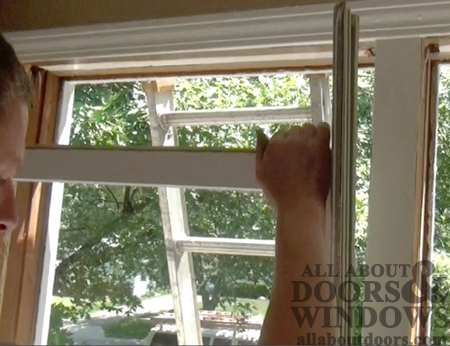 Make sure the window is right side up and facing the right direction--the latch should be on the inside. 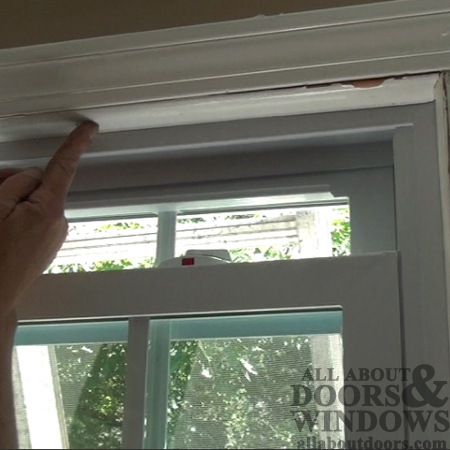 Once the window is secure in the frame, lower the window stops at the top of the jambs so you can access the screw holes. You may need a pry bar to do this. 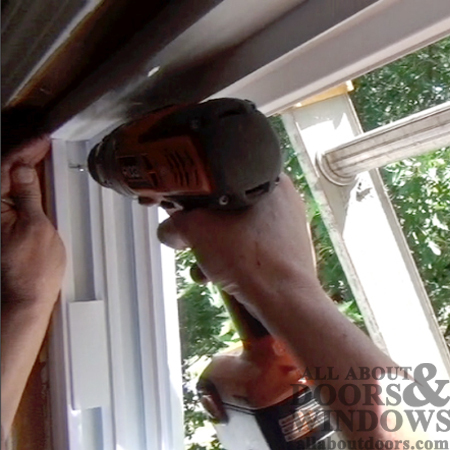 Install screws in the screw holes to hold the window in place. In the same way, raise the stops at the bottom of the jamb and install screws there as well. Once all the screws are in, move the stops back to their original spots. Reinstall the top and side stops. Secure the top and side stops with a nail gun. 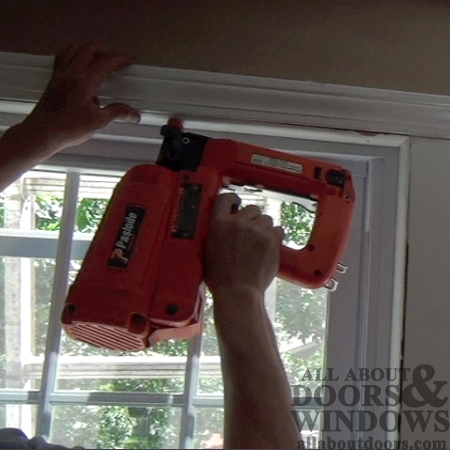 Next, use wood putty to cover the holes you just made in the door frame. 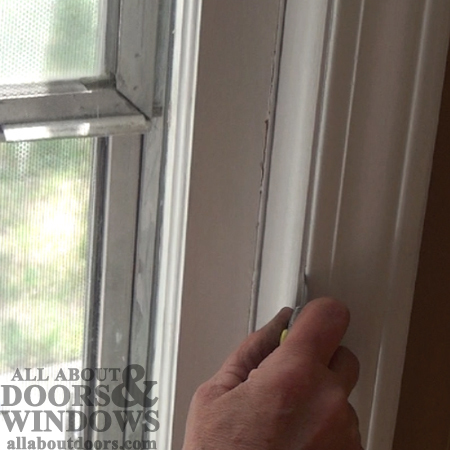 From the inside, apply a bead of caulk at the seam where the stops meet the window frame. 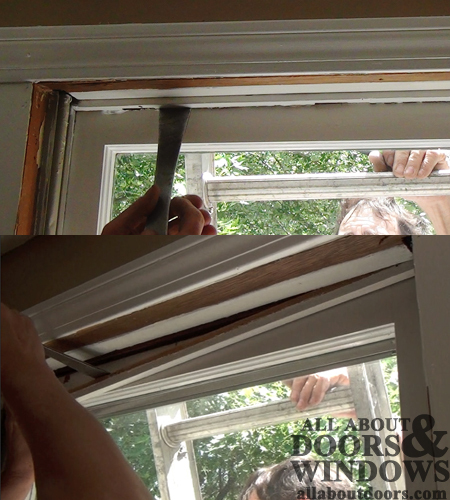 From the inside, apply a bead of caulk between the new window and the side and top stops. there shouldn't be any new caulking along the bottom of the window. 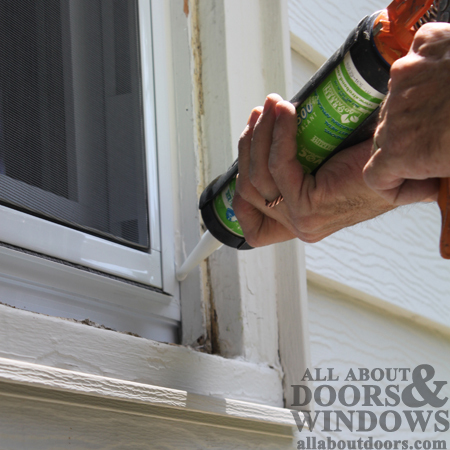 From the outside, apply a bead of caulk between the window and the house. Reference Guide: Which Stop is Which?